Every year we conduct two weeks of basking shark transect surveys in the Sea of the Hebrides and the Minch on the west coast of Scotland – this not only allows us to monitoring the hotspot sites we identified during our previous long-term survey, but also explore for new sites. If the weather is good, this is the most wonderful place on earth. Fortunately we have been blessed with excellent conditions for the last three years. As a result, sharks have been plentiful, although it’s the hotspot sites around Coll and Tiree and Hyskeir and Canna that have, as before, been the locations for the majority of our sightings. For 2014, we had spectacular results just off the north end of Coll, finally finding a big shoal that we believed was in the area. We observed & recorded seventeen sharks one evening, followed by fifty sharks the following day, the latter tally equalling our second best day for sightings from previous surveys – quite an event. We also recorded fourteen sharks breaching that day – a truly unique experience. Our second week of surveys coincided again with Sea Watch Foundation’s National Whale and Dolphin Watch week, so we regularly submitted our sightings of harbour porpoise, bottlenose dolphin, common dolphin, minke whale, orca and Risso’s dolphin. 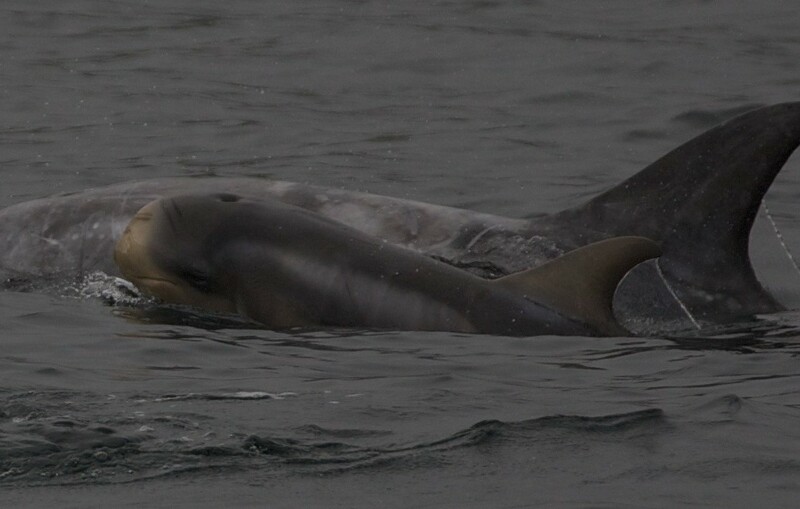 Our encounter with Risso’s dolphins was remarkable… the mother and calf shown in the image above were part of a pod of around 20 animals seen in the Outer Hebrides. Many calves were present in this group, providing not only a heart-warming sight, but a source of hope for the future. We’ll be sharing our photo-id images with other researchers to help identify the individuals and support their studies.